An e-galley was provided by Simon & Schuster via NetGalley in exchange for an honest review. Summary: After a student turns up murdered on Bonfire Night, Hazel and Daisy find themselves entrenched in another mystery in this delightfully charming fourth novel of the Wells & Wong Mystery series. Daisy Wells and Hazel Wong have returned to Deepdean School for Girls for a new school term, but nothing is the same. There’s a new Head Girl, Elizabeth Hurst, and a team of Prefects—and these bullying Big Girls are certainly not good eggs. Then, after the fireworks display on Bonfire Night, Elizabeth is found—murdered. The Good, the Bad, and the Ugly: Cute middle grade mystery series are so much fun. I know I would have loved the Murder Most Unladylike series when I was in the target age range for it. 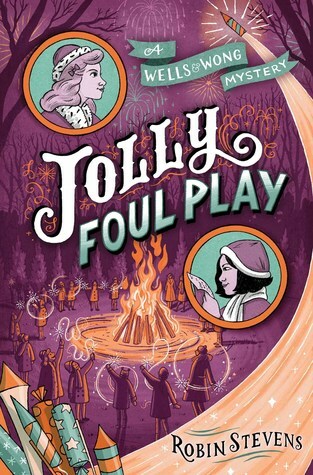 Jolly Foul Play is the first MMU book back at Deepdean since the first book (which was titled Murder Is Bad Manners in the U.S.). It was fun to see the boarding school world again, but I think I liked Daisy's home and the Orient Express better. However, I really liked how getting a bit more character development for Daisy and Hazel's friends, Lavinia, Kitty, and Beanie. Also Kitty's little sister? So much fun. The mystery isn't too complex, but I didn't figure it out either, so I think middle grade readers will enjoy the mystery plot. I liked the little developments with Alexander. If there is a romance brewing between him and Hazel, it is cute and innocent and totally appropriate for MG. The Verdict: Overall, I preferred Poison Is Not Polite and First Class Murder, but Jolly Foul Play is still cute, fun, and a quick read. Will I be adding this book to my library? : Soon, hopefully!